I'm not quite done sorting through all of the fabric, notions, thread, etc. 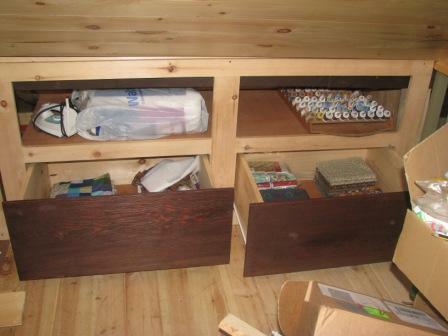 and I'm still trying to figure out how to best organize everything, but at least the drawers are in! So I'm very happy! D worked really, really hard on these and I'm very grateful! Also, here's a picture of the FatQuarterShop's Designer Mystery BOM Block number 1 (from June 2010). 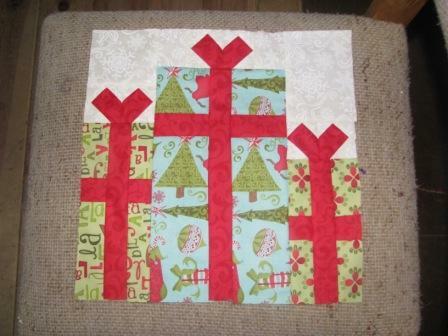 This block was designed by Gudrunm Erla and is called "Gifts Under the Tree". Isn't it pretty? 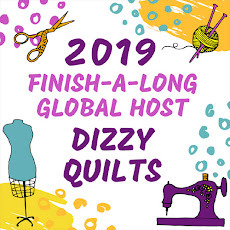 I'm also thinking about participating in my first "Quilt Along" starting in November sponsored by "Moose on the Porch Quilts". You can read all about it here. I purchased a Layer Cake from the Fat Quarter Shop last month which I absolutely adore so I'll be using that one. I'll post a picture of the Layer Cake fabrics next week. Unfortunately, I didn't get a chance to work on Heather's quilt this weekend, so it looks like it won't be ready before she leaves on vacation this Friday. I may have to pay her a visit the week prior to the wedding to give her the quilt. So I sign up for the September Fab ShopHop... pretty simple stuff really - you click on quilting websites and look for a bunny. When you find the bunny, you might also get a cute block pattern. Collect the bunnies to win prizes and collect the blocks to make a beautiful quilt. 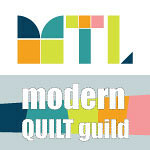 So I've now visited 129 quilt shops, collected 129 bunnies - but have only discovered 7 of the 13 block patterns! My sewing room is being upgraded! I haven't posted any pictures because I totally forgot to take some, but my sewing room at the cottage is getting a much needed face-lift! D has hired a carpenter to build huge drawers in the storage space on the right and left of the room where I'll be able to store fabric, batting, books, magazines, etc. I cannot wait! Even though the room looks like a war zone right now, I was able to make progress with Heather's quilt and I'm pretty confident I'll be able to finish the quilting next weekend. I also finished block 1 of the BOM program I entered back in June! 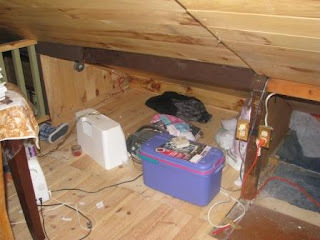 Will post pictures of everything next week (including the progress made on the new sewing room set-up! ).